This tutorial shows how to use the Holon Platform Property model, the Datastore API and the Vaadin Flow UI module to build a simple web application, leveraging on Spring Boot to auto-configure and run the application using an embedded servlet container. The web application purpose is to manage a simple product entity, persisted in a RDBMS, allowing the user to list the available products, display product data, create a new product, update an existing product and delete a product. How to configure and build a web UI using the Holon Platform Vaadin module and provided fluent component builders. How to use the @QueryParameter annotation to automatically inject query parameters in routing targets. How to use the Navigator API to handle the application routing with query parameters support. See the Property model reference manual for detailed documentation about the Property model. See the Datastore API reference manual for detailed documentation about the Datastore API. See the Vaadin Flow UI reference manual for detailed documentation about the Holon Platform Vaadin Flow module. See Getting started to know about the last Holon Platform release version. We’ll use the JDBC Datastore implementation to manage data persistence, auto-configured and enabled using the Holon Platform Spring Boot starter that includes the HikariCP DataSource. The product entity properties, declared through a suitable PathProperty type, where each property path name correspond to the products database table column name. A property caption message is specified for each property and later used by the UI components. The PropertySet which represents the product entity, where the the ID property is declared as identifier property. 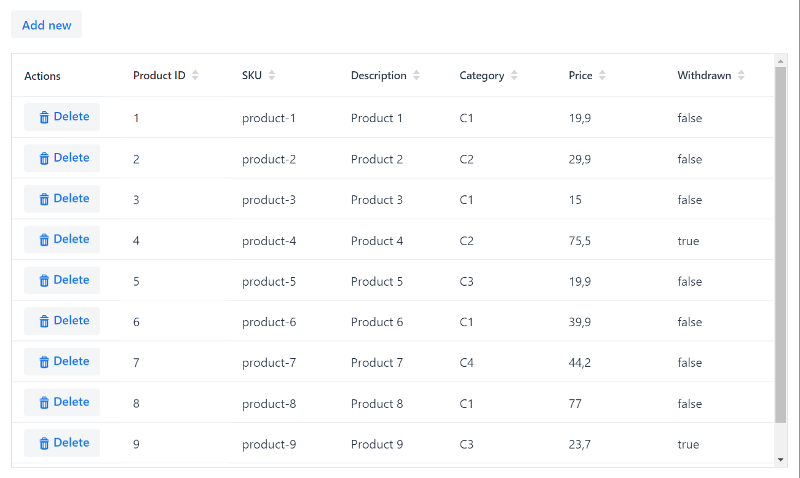 A DataTarget named products to be used with the Datastore API to refer to the products database table. See the property model tutorial to learn the basics about the Holon Platform property model. Now it’s time to configure the Vaadin Flow application UI using the Holon Platform Vaadin Flow module and the Spring Boot auto-configuration support. After the configuration phase has ended, it’s time to create the application routes, i.e. the components which represents the application views (which can be intended as the application pages). The @QueryParameter annotation is used on routing target components to provide automatic URL query parameters value injection, with a consistent Java type conversion support. See the Vaadin Flow module documentation for detailed information about the query parameters injection and type handling. Using Spring Boot, the Holon Platform Navigator API is automatically configured and setted up for the current UI, and will be used to perform the application routing, i.e. the navigation between the application routes, with a simple and consistent support to provide and convert the query parameter values. See the Vaadin Flow module documentation for detailed information about the Navigator API. The default route, mapped to the empty "" route path and represented by the Home UI component. The home route will list all the available products and provide the new, edit and delete actions. The manage route, mapped to the "manage" route path and represented by the Manage UI component. The manage route will provide an input form to create or update a product. Using the @Route annotation, each route class is automatically enabled as Spring bean, allowing dependency injection (for example using the @Autowired annotation) and bean lifecycle hooks (for example using the @PostConstruct annotation). The Home route is the application default view, i.e. the view displayed when a navigation path is not specified, since it is mapped to the empty "" route path. It lists the available products using a Holon Platform PropertyListing component. The PRODUCT PropertySet is configured as listing property set, so the listing columns will be automatically generated for all the properties that are part of such property set. The product property captions (configured through the message(…​) property builder method in the Product data model) will be used by default as column headers. A Datastore is obtained by injection and used as the listing data source, providing the product TARGET as query target. Since the PRODUCT property set declares the ID property as identifier, its values will be used as item identifiers in the listing. A item click listener is configured so that when to user clicks a listing row, the edit action is perfomed: the Navigator API is used to navigate towards the manage route path, providing the product id as id query parameter value. Finally, a delete action is provided by adding a virtual listing column using the withComponentColumn builder method: for each row a Button is generated with a click event handler, which uses the Datastore API to delete the product which corresponds to the listing row and refreshes the list at the end. Furthermore, a "Add new" button is added at the top of the content layout, to allow the user to create a new product. When the user clicks the button, a navigation towards the manage route path is performed using the Navigator API, obtained statically for the current UI using the get() method. The Manage route is used to provide the product data input, allowing to create a new product or update an existing one. A URL query parameter named id is used to provide the id of the product to edit and its value is automatically injected in the id field using the @QueryParameter annotation, with automatic value conversion from the String type URL query parameter value to the required Long Java type. The Holon Platform PropertyInputForm component is used to allow the user to input the product property values and it is configured using the PRODUCT property set. This way, an input component for each property of the set is automatically created and displayed on the UI. The ID property is setted as read-only, so that it’s value cannot be modified by the user, since the product id value is auto-generated by the database. The SKU property is configured as required: a validator to check the value is not null will be automatically added and the required state will be displayed for to the input field. A default value is provided for the CATEGORY property. A validator is configured for the DESCRIPTION property, to check the value is minimum three characters long. Any Property specific validator is inherited by the input form, so, for example, the not negative price validator configured for the UNIT_PRICE property in the Product model class will be inherited by the corresponding input component. The product property captions (configured through the message(…​) property builder method in the Product model) will be used by default as the form input component captions. The id query parameter is used to discern if the form is in edit or insert mode. When the id query parameter is null, we assume the form to be in insert mode, otherwise the product with the corresponding id value is loaded form the backend using the Datastore API and setted as input form value, causing the form to load all the product property values and setting it as input components value. Finally, a Save button is provided to allow the user to save a new product or confirm product data update. When the user clicks the button, the Datastore API is used to save the product data, obtained as a PropertyBox form the input form. Then the user is redirected to the application default route, using the navigateToDefault() method of the Navigator API. 1 Query parameter declaration for automatic value injection in the id field. Since value() annotation attribute is not specified, the query parameter name is assumed to be the field name (id). You’ve learned how to use the Holon Platform Vaadin Flow module to create and run a web application which allows to manage a simple data entity, leveraging on the Property model and the Datastore API to configure the UI components and manage the data persistence in a RDBMS. The @QueryParameter annotation and the Navigator API have been used to handle the application routes navigation and the URL query parameter values. The source code of this tutorial is available on GitHub. See the Holon Platform tutorials to explore other available tutorials.